On Tuesday, November 8, 2016, His Beatitude, Metropolitan Tikhon hosted His Grace, Bishop Irinej [Dobrijevic] of the Serbian Orthodox Diocese of Eastern America to the Chancery here. Elected in May 2016 by the Holy Assembly of Bishops of the Serbian Orthodox Church, replacing His Grace, Bishop Dr. Mitrophan, Bishop Irinej was enthroned at Holy Trinity Serbian Orthodox Cathedral, Pittsburgh, PA on October 1. Born and raised in Cleveland, OH to parents who left the former Yugoslavia at the conclusion of World War II, Bishop Irinej had previously served for a decade as the Serbian Orthodox Bishop of Australia and New Zealand. Bishop Irinej is a graduate of both Saint Tikhon’s Seminary, South Canaan, PA and Saint Vladimir’s Seminary, Yonkers, NY. 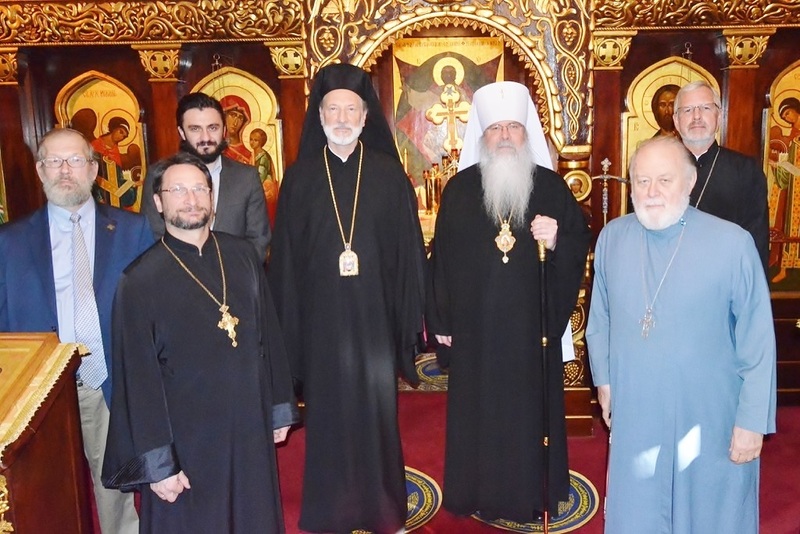 Accompanied by his secretary, Milovan Jovanovic, Bishop Irinej was welcomed to the Chancery by Metropolitan Tikhon; Archpriest John Jillions, Chancellor; Archpriest Eric G. Tosi, Secretary; Protopresbyter Leonid Kishkovsky, Director of External Affairs; and Alexis Liberovsky, Archivist. In Saint Sergius of Radonezh Chapel, the hierarchs venerated the relics and icons of the North American Saints. Metropolitan Tikhon formally welcomed Bishop Irinej before the hierarchs exchanged gifts. “On behalf of the Holy Synod of Bishops of the Orthodox Church in America, I offer you my sincere congratulations on your enthronement as Bishop of the Eastern American Diocese of the Serbian Orthodox Church and I look forward to working with you on the Assembly of Bishops level and in whatever other ways our Churches might collaborate,” Metropolitan Tikhon said in his welcoming remarks. “You are very familiar with the Orthodox Church in America, having graduated from both Saint Tikhon’s and Saint Vladimir’s Seminaries, and we are familiar with you from your good relations with our clergy and faithful over the years. As you mentioned on Saturday evening, there have historically been good relations between the Serbian Orthodox in America and the Metropolia, and those good relations continue today. “I myself find great inspiration in the great Serbian saints, beginning with Saint Sava and continuing through to the newly glorified Saint Sebastian and Saint Mardarije, who were active in the American Mission,” Metropolitan Tikhon continued. “I have especially high veneration for Saint Nicholai [Velimirovic], who spent his last years at Saint Tikhon’s Monastery and remains a source of inspiration for the monastics and seminarians and many others throughout the Orthodox Church in America. Metropolitan Tikhon presented a hand-carved wooden panagia to Bishop Irinej, who in turn gave a beautiful book, The Christian Heritage of Kosovo and Metohija, which documents the tragic history of the region in which over 100 historic churches have been destroyed in recent years, to Metropolitan Tikhon. Mr. Liberovsky offered a presentation on original holdings in the OCA Archives concerning the recently canonized Serbian missionary saints of North America, Mardarije [1889-1935] and Sebastian [1863-1940], both of whom served in the North American Mission before the establishment of the Serbian Diocese. According to Father Jillions, Metropolitan Tikhon and Bishop Irinej discussed a variety of matters, including the recent Council in Crete, at which Bishop Irinej was present; the Assembly of Canonical Orthodox Bishops of the USA; pastoral challenges facing the Church in countries outside traditional Orthodox lands; and theological education in America. Metropolitan Tikhon also spoke fondly of his 2006 visit to Serbia’s Soko Monastery, where he had been the guest of His Grace, Bishop Lavrentije. Bishop Irinej was feted at a luncheon in the Chancery dining room. In related news, on Saturday, November 5, Metropolitan Tikhon and his secretary, Archdeacon Joseph Matusiak, were among Bishop Irinej’s guests at a gala fundraiser in New York for the benefit of Manhattan’s Saint Sava Serbian Orthodox Cathedral, which was destroyed by fire on Pascha 2016. [See related story.] On behalf of the Orthodox Church in America, Metropolitan Tikhon presented a check for $1,000.00. Among those also in attendance were His Grace, Bishop Sevastianos of Zela, Greek Orthodox Archdiocese of America, and His Grace, Bishop John of the Diocese of Worchester of the Antiochian Orthodox Christian Archdiocese of America. A photo gallery of both events is available on the OCA web site and Facebook page. This entry was posted in News and tagged Bishop Irinej, His Grace, Metropolitan Tikhon, Saint Sava Serbian Orthodox Cathedral, Serbian Orthodox Church by Orthodoxy Cognate PAGE. Bookmark the permalink.